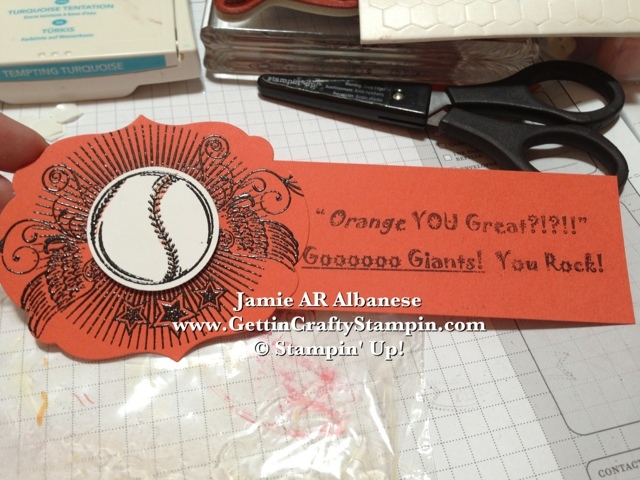 Getting Crafty with Jamie: Orange You Great, SF Giants? 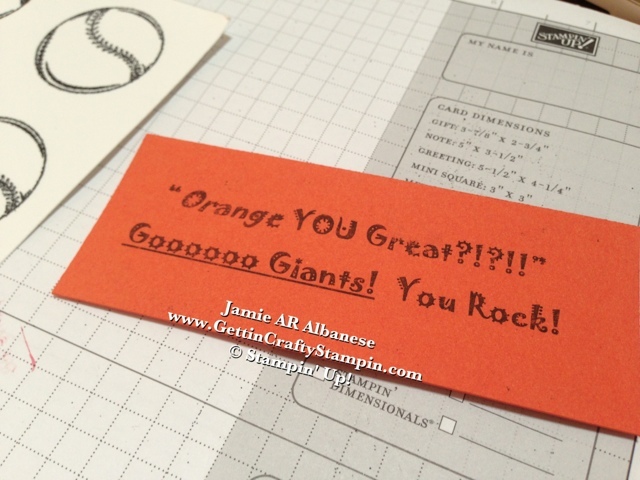 Orange You Great, SF Giants? he's a blessing and allllll boy! 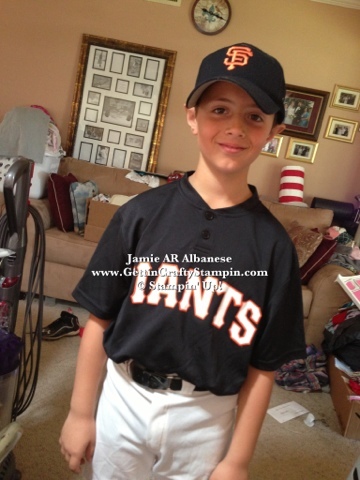 He ADORES Sports and this year is on an amazing team, the SF Giants! He has amazing coaches, a fun bunch of boys and we are looking at a great season! I LOVE Cheering the team on and when Snack is assigned to our family, we pull fresh oranges from our garden (we have 16 fruit trees) as well as other snacks. I decorated the bags of Oranges with this fun topper! 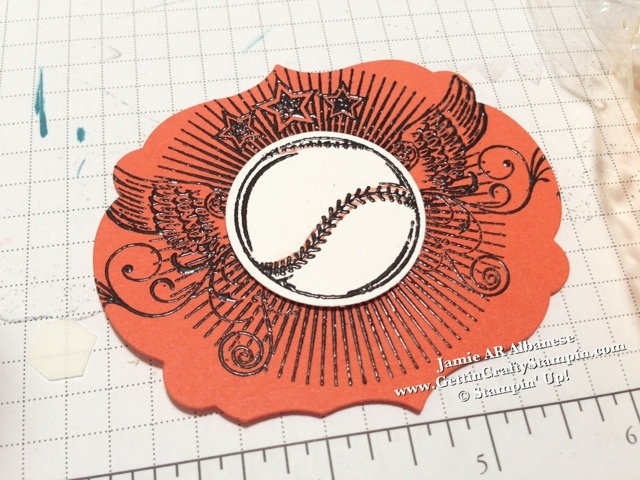 Embossing the Great Sport stamp set (Idea Book & Catalog) with Black embossing powder on Tangerine Tango card stock. Using our Labels Collection Framelits (Idea Book & Catalog) to frame out this fun decoration. Printing on our card stock is easy and you can say anything you want! What a fun flag!! 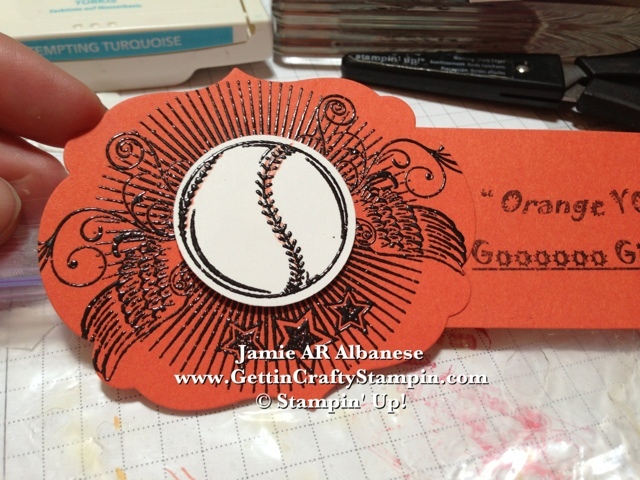 Accenting the stripes with our Tangerine Tango Stampin' Write Marker instead of Red. It ties in the color theme and pulls up the team color while still adding the color to the stitches. My Big/Baby Boy. He loves sports and is fun to watch. Come on, you can sooo see why I love this guy! 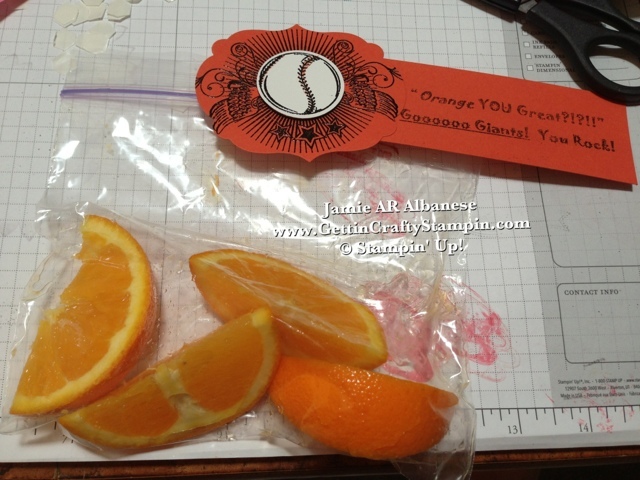 Stampin' Dimensional Adhesive holds this to the top of the Zip Lock bags. These juicy oranges are a perfect way to wrap up the game after all the batting, running, fielding.. The FUN Topper to this 1/2 orange from our organic trees is a great way to celebrate a game, win or lose. What team do YOU Cheer on?!?! Grab this or one of our many universal stamp sets. Cover many occasions, like this stamp set covers 4 sports!! It is universal with the ability to celebrate by using different papers and colors. See this stamp set and ALL of our stamps, papers, accessories and more by Clicking HERE to see all of our Idea Books & Catalogs. Order on-line 24/7 and save 10% by selecting me as your Demonstrator (Jamie Albanese). What a fun topper for a bag of oranges. You're so lucky to be growing oranges in your back yard. Mine is just growing snowflakes! Thanks for joining the LNS with your second project. What a wonderful topper, I just love it. Thanks for playing this week at lns!